As we wandered around Rynek Główny (the Main Market Square) in Krakow’s historic centre and avidly absorbed its old-world charm, it felt as though we had taken a step back in time. In fact, the roots of this captivating Polish city date back to the 11th century. For many hundreds of years Krakow was Poland’s royal and ancient capital and home to world-renowned scholars and artists. Today, it is a bustling city steeped in history … the hub of modern-day Krakow. The vastness of the Square at about four hectares (10 acres) is quite simply breathtaking in its scope. It was originally laid out in 1257 after the Mongol hordes swept through the city. And it was here in olden times that merchants gathered to trade amber, gold and other valuables. Nowadays, it is alive with people and activities … there is never a dull moment. It is a place for festivals, public gatherings and parades. 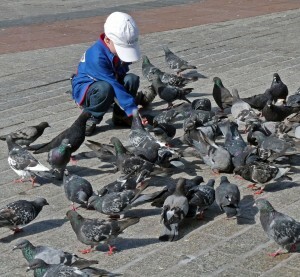 It is a venue, too, where numerous plump well-fed pigeons vie for space. Legend tells us that these birds were once courageous knights who bravely defended the city in a previous life-time. Many of the structures surrounding the plaza as well as its principal tourist attractions display a variety of architectural styles and were constructed many centuries ago. During our stroll around the Square, we passed impressive colonnades, historical pavilions and archways, ornate wrought-iron lamp standards, statues and sculptures, unusual doorways and windows, decorative moldings and plentiful outdoor cafes and restaurants. We were entertained by street musicians and mime-artists. We admired the myriads of blooms displayed by flower-sellers. We tasted the specialty breads offered by the street vendors. We lingered at stalls displaying artwork and lace-ware. We paused as an elderly gentleman pondered his next move in a game of chess. Then in need of a short break, we relaxed at an outdoor café and savored a cappuccino topped with latte art. From our vantage point, we watched the world go by. Elegant horse-drawn carriages clip-clopped past our table. Nuns dressed in the traditional black habit scurried about their duties. Krakow natives walked their pedigree dogs. And proud parents pushed baby strollers. 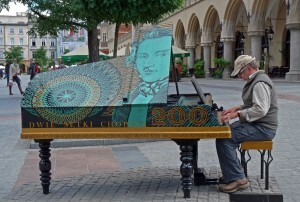 A popular attraction during Chopin’s 200th anniversary in 2010 was a brightly painted piano. Many times a passing tourist would pose on the piano stool with fingers poised above the keys … a sure photographic opportunity. Several buildings have an important presence in the Square. The red-brick façade of St. Mary’s Basilica, completed in the early 1300s, dominates the northeastern corner. From the higher of its two Gothic towers, a bugle has been played on the hour for more than 600 years. The tune ends abruptly in mid-chord. The folklore behind this tradition tells us that during a Mogul invasion of Poland an arrow pierced a trumpeter in the neck before he could finish the warning bars. Since that time no bugler has completed the refrain. At the southern end of the plaza are the Town Hall Clock Tower and tiny St. Adalbert’s Church. About 100 steep and well-worn steps lead to the top of the Gothic-style tower. It is well worth the climb. From the narrow windows 70 meters above ground, we were rewarded with panoramic views across the rooftops of Krakow. Looking down, one can really appreciate the enormous dimensions of the square. Tiny St. Adalbert’s Church, built in the 11th century, is one of Poland’s oldest stone churches and, in fact, precedes the construction of Rynek Główny. Now a popular venue for weddings we witnessed a bride and groom happily emerging from the church having tied the proverbial knot. In the heart of the plaza is the Cloth Hall with its two rows of stalls where once textiles were traded. Rebuilt in the 16th century, its Renaissance architecture features an ornate roof, picturesque stairs and arched galleries. Today, the building houses the Krakow National Art Museum and small stalls selling assorted gifts and souvenirs. But don’t stop exploring when you’ve absorbed all that Rynek Główny, a UNESCO World Heritage site, has to offer. There are so many other sights for visitors to Krakow to experience. A short distance away you will find the 17th century St. Peter and Paul’s Church with its life-size stone statues depicting the 12 apostles. 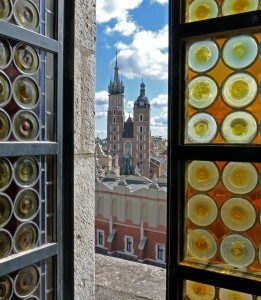 Continuing on, you will come to the 14th century castle and cathedral at Wawel Hill. This knoll on the bank of the Vistula River is the site of the City’s earliest settlements. Just outside the City walls lies Kazimierz, the core of a once-thriving Jewish community, founded in 1335. A short distance away is Schindler’s enamelware factory, once a safe haven for Krakow’s Jews and now a museum of wartime activities. And then there’s the University of Krakow with its medieval courtyard. It was here that Nicolaus Copernicus, the famous mathematician and astronomer, and Pope John Paul II once studied. 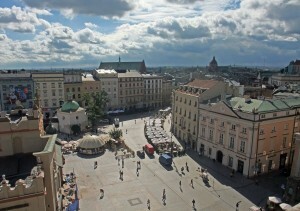 Krakow remains one of Europe’s largely unspoiled cities. It is a delight to visit. Its rich cultural diversity, fascinating history, stylish architecture and old-world atmosphere, reminiscent of a former and more gracious age, all combine to make it an alluring destination for anyone planning a trip to Poland.